If you did much dismantling of PCs back in the 1980s and 1990s, you might be familiar with the Dallas Semiconductor range of potted real-time clock modules. These were chunky dual-in-line devices containing clock and non-volatile RAM chips, a crystal, and a lithium battery. The battery was good for about a decade, which was fine for most PCs of the day because the majority of desktop computers are replaced long before that deadline. [Glitch], however has an industrial single-board computer with a 486 processor that has had a life much more prolonged than its desktop siblings due to its application. The battery in the onboard Dallas DS1387 has long ago expired, and since these devices are so long out of production to be unavailable, he’s had to improvise. Improving on some previous documented projects he found through an internet search, he carefully ground away the potting compound to reveal a couple of the battery conductors, cut them with a PCB drill, and mounted a lithium cell holder on the top of the device with some tidily soldered Kynar wires to bring in the power. A CR1225 cell was used rather than the ubiquitous CR2032, as space was at a premium in the width of the ISA card form factor. The potted RTC module is something of a rare device these days, but if you have a retro computer containing one this seems to be a very useful piece of work to bring it back to life. We’ve covered another similar one with a slightly larger battery in the past. Oooh those. They’re a well known problem in the (small) community still toying around with Philips’ CD-i consoles. Taking a dremel to them makes one _hell_ of a mess – Consider yourself warned. BTDT, but that was already this way back in the nineties. I don’t know if any of the old sites devoted to this information are still easily accessible on the web, or if they’ve vanished with GeoCities and similar hosting sites. And this particular one was a parallel ram, so it was really “fun” wiring it up to clear the memory/kickstart the clock before putting it back into the vending machine it came from. Try reloading it. Imgur doesn’t seem to appreciate the hotlinking from here. Good old hack, I did this on SPARCStations many years ago. The Dalls IC also handles the machine IDs of some systems. Yeah, if memory serves me well, SPARC machines were annoying, in that without the RTC you had to reconfigure it every time you powered on, otherwise it wouldn’t boot (at least some models). I also did the same modification to the Dallas IC for this reason. Correct. They also store the MAC address and hostid which (back in the day) could screw up node locked application licenses. If you needed a replacement and didn’t have a dump of the contents, Sun would sell you a preprogrammed replacement in exchange for the code on top of the module and many dollars. Exactly, that’s why there are two common fixes: writing a script to set all the parameters from the serial console, or “fixing” the RTC/NVRAM battery. Wonder if it wouldn’t be easier to desolder the module and put in a substitute? They aren’t available any more, and any NOS you might find will also have dead batteries. I bet you could make a substitute. Make a little PCB that’s the same size as the original module with the same pinout and simulate everything with modern microcontroller and a modern RTC (or use a uC that has a built-in RTC). With modern SMD components​, fitting that on a tiny board of the correct size shouldn’t be too hard. I wonder if there’s a market for something like this. The microcontroller would need to be able to pretend to be a 100ns SRAM. Not saying you can’t, just that it’s harder. Not the same device, it won’t work in place of a DS1387. The DS1387 has a great deal more NVRAM. Pretty sure this will speed up the leaking of the old cell. This “repair” is making things worse. Yeah, that’s why I cut into the side, toward the bent-up IC terminals, rather than trying to chop the top off as other guides suggest. Disturbing the potting and potentially rupturing the cell is completely avoided this way. 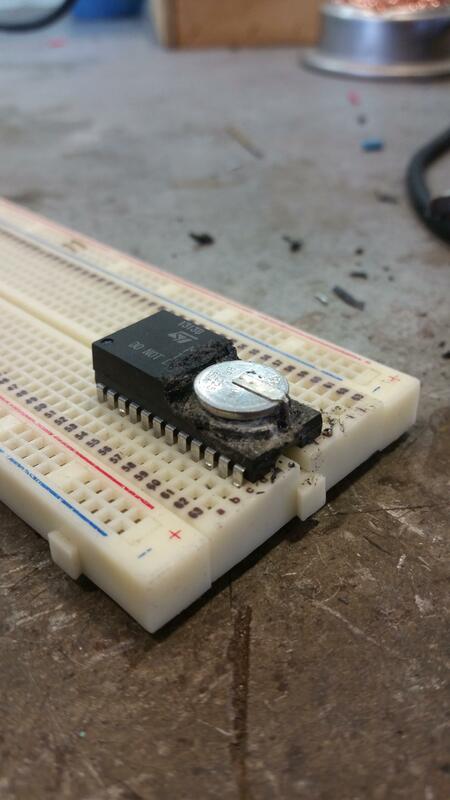 A hack as old as battery backed ram and clock modules and a hack that should never be forgotten! I have a DS1225Y in a bag of vintage chips from an eBay listing. No idea if it’s used or not, but given the lack of solder on its leads, I’m inclined to think it’s NOS and therefore has a relatively intact battery… not that I’m anywhere /near/ the warranty period on these things. Still… should be fun to play around with, if I ever get around to using it for something. Too bad. The smaller (16 kb) DS1220AD claims: “Lithium energy source is electrically disconnected to retain freshness until power is applied for the first time”. The DS1225 does not appear to be blessed with that particular feature. Maybe they’re trying to keep this place from turning into Reddit? I had to do a similar mod for a customer. She was an english professor that’s been using the same PC for all her writing since ’91. No one else would go near her machine (being so old and all) but I was lucky to find a write-up on which pins to tap into and where to dremel on the chip, ended up being a pretty simple project. I’m working on a replacement module for 48T02/48T08 RTC/NVRAMs found in Sun equipment (among other things) that completely removes the “CAPHAT” potted module.